Jeremy Young wanted to join the military his entire life. After working a warehouse job for two years after high school, he felt it was time to do something more meaningful. He joined the Army in 2010 as an Infantryman and was assigned to the 2nd Battalion, 5th Infantry, 3rd Brigade, 1st Armored Division. On July 3, 2012, during his first deployment, Specialist Young and his unit were in an over watch position in Eastern Afghanistan when an Afghan Soldier turned on them, shooting at SPC Young and four others. SPC Young was just a few feet away from the attacker, who shot him 18 times. The gunshot wounds caused severe damage to SPC Young’s right leg, right hand, left hand, and left arm. Once back in the United States, Jeremy endured numerous surgeries and therapies at Brooke Army Medical Center in San Antonio. While in the hospital, Jeremy met his wife, Kayla, whose brother-in-law was in the incident with Jeremy, and the two formed a connection there. The two formed a connection there. After attempting limb salvage, doctors amputated his right leg in December 2014. Now medically retired, Jeremy and Kayla love spending time together outside with their dog. The two are looking forward to starting a family together, but Jeremy’s excitement about this dream is clouded with concern. One of Jeremy’s biggest fears is that once he and Kayla have children, he will fall while carrying his baby up the stairs. Because Jeremy’s current home is not wheelchair accessible, he has to constantly wear his prosthetic, causing intense pain and discomfort. It is especially frustrating for Jeremy to be restricted physically, since he led an active lifestyle before his injury. Receiving a single-level, specially adapted custom Homes For Our Troops home will mitigate these worries. Kayla cannot wait for the day they are living in a place where her husband will be happier and more comfortable. 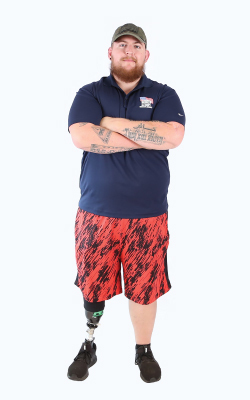 Once Jeremy receives the home, and is not coping with the daily pain from his prosthetic, he will have more energy for helping other Veterans in the area and volunteering. He would like to start a Ruck March fundraiser to pay it forward to organizations that have helped him, including Homes For Our Troops. Originally from North Carolina, Jeremy is choosing to remain in the state to be close to family and the healthcare. Jeremy wants HFOT’s donors and supporters to know this home will immensely improve his daily life. “Thank you for what you’re doing for injured Veterans across the country; you’re changing their lives and mine,” he says.